CodeKit has a built-in server that always hosts the active project. The app automatically refreshes every browser that's connected to this server. Click the Preview Button in the top right corner of the window. 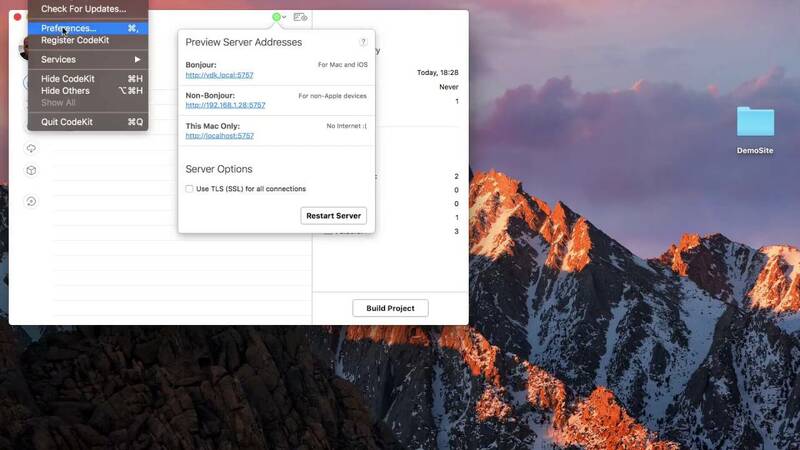 Copy the address to your other devices and be sure each is connected to the same WiFi network as your Mac. For static sites, that's it. What Address Do I Enter In The Textfield? Which Address Do I Load In My Browser? ALWAYS go to CodeKit's internal server address (the one that opens when you click the "Preview" button). That's the only one CodeKit will auto-refresh. When you use an external server, CodeKit becomes a reverse-proxy; it talks to your external server to load content. When you save a stylesheet, CodeKit refreshes the browser by injecting changes without reloading the entire page. When you save a page or script, however, the whole site reloads to capture those changes. Click the Server Button at the top of CodeKit's window. The popover that appears shows three addresses. This will always have the form http://[your computer name]:5757. If your computer's name is long, you can shorten it in the Sharing Pane of macOS's System Preferences. The final address is always just localhost:5757. Use this if your Mac is not connected to any network. WARNING: On some networks, the Bonjour address may not behave correctly. In those cases, use the Non-Bonjour address. CodeKit supports TLS (formerly called SSL) on the Preview Server. To enable it, simply click the checkbox in the Server Popover. CodeKit's server will restart and you'll see https:// addresses. NOTE: When TLS is enabled, if you forget to type https:// instead of http://, the page will hang and fail to load. You MUST use https when TLS is on. Why Am I Asked For My Password? CodeKit automatically generates the certificate required to run a secure server. You must tell your Mac to trust that certificate, which is why you're prompted for your password. This needs to be done only once. It Doesn't Work In Firefox! Firefox is a bad citizen of macOS. Instead of using the system-wide Keychain, Mozilla insists on having their own. Because of this, to use TLS in Firefox you must first enable enterprise certificates in Firefox and then install CodeKit's certificate in Firefox. This article will help. Using a different, better browser will also help. Before remote devices can connect to the secure Preview Server, you must install and trust CodeKit's TLS certificate on those devices. Open the Server Popover, click Share TLS Certificate, and then choose a way to send the certificate to your device (I recommend email). Tap the *.PEM file attached to the email, then tap Install, enter your passcode, and tap Install twice more to confirm. Go to Settings > General > About > Certificate Trust Settings and slide ON the switch next to "CodeKit Certificate Authority". Double-click the *.PEM file. This opens the app Keychain Access and adds the certificate to your keychain. In Keychain Access, double-click the "CodeKit Certificate Authority" item. At the top of the window, expand the "Trust" section, then choose "Always Trust" for the "When using this certificate" option. Close the window and enter your password when prompted. Google how to add and trust a root CA certificate to your version of Android. The certificate CodeKit generates is unique; you are the only person who has it. Because you have told your Mac and devices to trust anything signed with that certificate, it's important that you keep it private. If a malicious third party gets it, they can use it to fool your browsers into thinking fraudulent websites are legitimate. If your certificate goes public, remove it from your Mac using the app Keychain Access. On iOS, remove it by opening Settings and scrolling down to "Configuration Profiles". Finally, click Generate New Certificate in the Server Popover. You'll need to re-share that new certificate to all your devices. See the Troubleshooting page for things to check. CodeKit strips all domain= values from each Set-cookie: header returned by your External Server. This causes the browser to store the cookie for the current document's domain, which is exactly what we want. 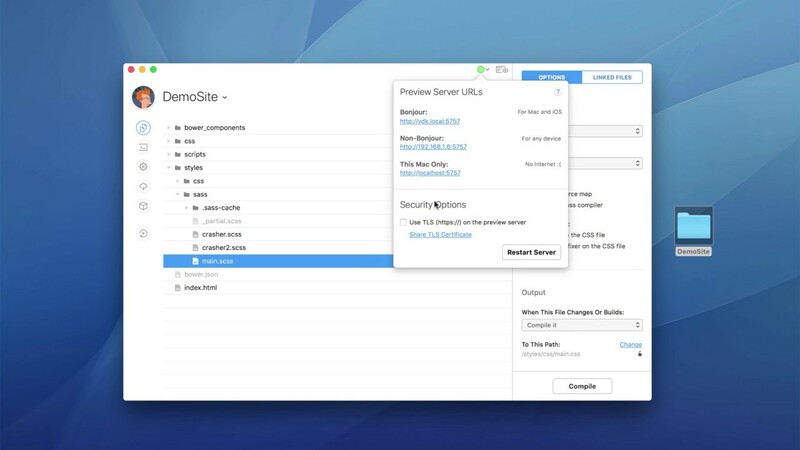 The domain returned by your External Server will not match the domain of CodeKit's built-in server, so the browser would normally not store the cookie as instructed. Simply removing the domain value is more reliable than trying to modify it. If your External Server returns gzipped or deflate-ed content, CodeKit will uncompress that data before sending it to the browser. This allows the app to inspect the page content and inject its reload script, if needed. If your site accepts large uploads (such as videos or photos submitted through a form), you should not test those features while previewing the site through CodeKit's server. The upload will likely time out.